These are now available at an even better price. 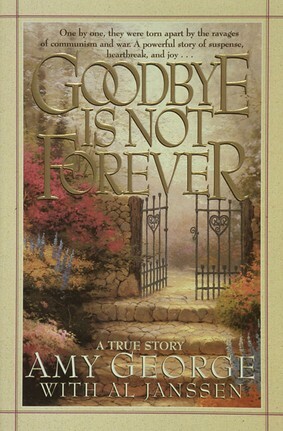 You will receive a 10% discount on orders of 10 or more Goodbye Is Not Forever books. I give this book away because it's a well-written autobiography, because it tells a part of history we don't usually hear, and because it introduces people to Jesus Christ in a non-threatening way through Amy's experiences. One copy usually makes the rounds of a dozen people or more before it makes its way back to me. It's an excellent story, compelling, and well-written. Amy George has written the most touching and miraculous true story about her life as a child growing up in early poverty in Russia until her marriage and wonderful life with devout evangelist, author, radio teacher Bob George. It show how real Jesus is and how much God loves His people. I weep tears of joy every time I read Amy's book. I buy copies and give them to friends as often as I can. I praise the Lord often for the ministry He has given to Bob and amy George. They have real humility and they are honest and loving people of God. they have a beautiful family and I came to a true knowledge of Jesus Christ through Bob George's 30 year radio ministry.